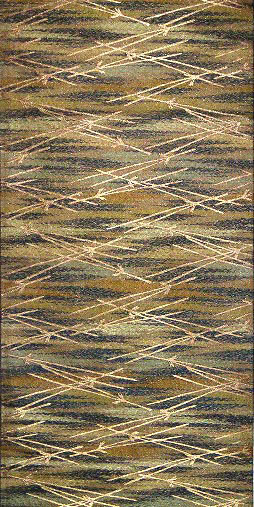 This is another Obi whose photos do not begin to portray the beauty of the weaving, with the highlights of the pure gold. 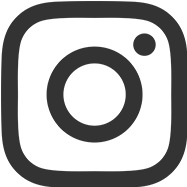 The natural pastel background colors are also very difficult to find…this is truly a very rare artwork. 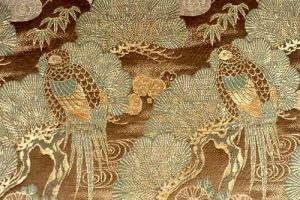 This is a rare, hand woven Silk “Maru Obi,” which is the most formal and most expensive of the Japanese Obi. 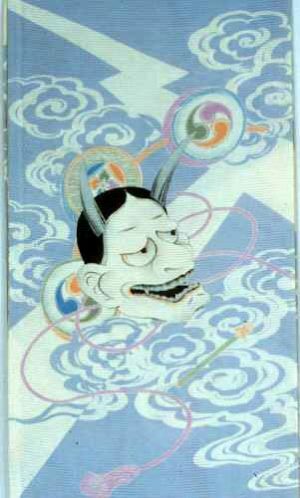 A Maru Obi has but one seam, and has been woven in a continuous pattern and then folded over to create a double sided vision. 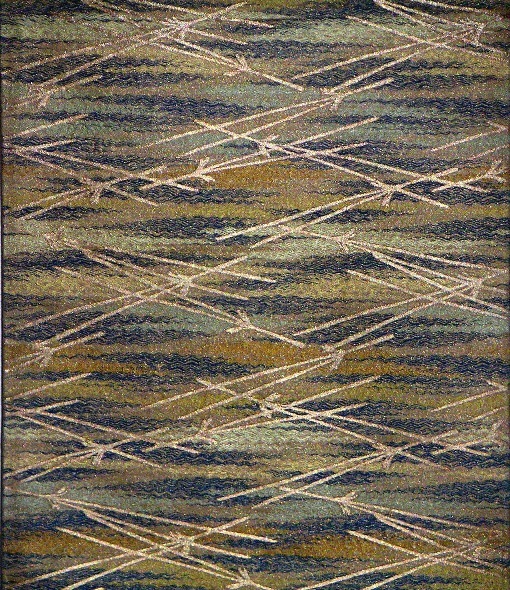 A unique feature of the Maru Obi (found only in some antique examples) is a dyeing and weaving process that, when viewed from different angles, appears to make the colors change. 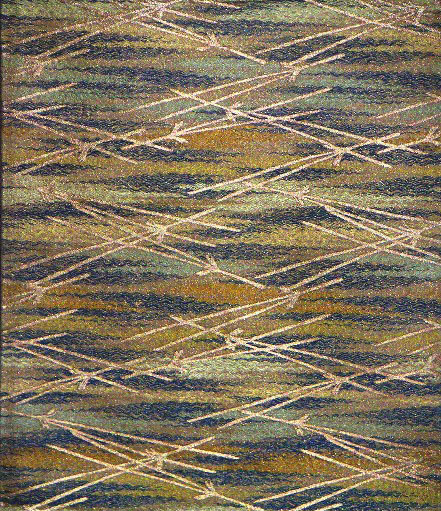 The Silk threads in this Obi have a marvelous sheen that is particularly noticeable when this occurs, as the crossed Pine (“Matsu”) are hand woven in pure gold thread whose shine makes them stand out magnificently against the unusual, stylized, wavy lines in shades of light green, purple, black and burnished gold in the background. The Pine symbolizes longevity in the Japanese culture. It is an auspicious sign, symbolizing a thousand years of life, which would have been significant for the young woman who would have worn this brilliant Obi. Married, older women would never have worn such a striking pattern in their Obi as it attracts too much attention. Additionally, the Pine is also considered a propitious symbol as it is the tree of good fortune, because it is resistant to the wind and resilient beneath the snow. 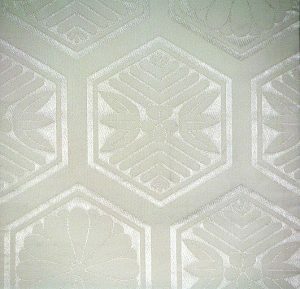 The Crossed Pine have been repeated time and again to create a downward flowing eye movement in a larger than usual “Meiji jimon” pattern. This is a stylized Japanese design that uses the same element over and over again to create a strong statement with this Obi. 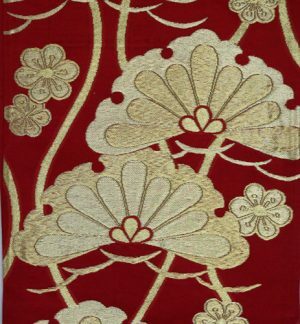 The intricacy of the design and the unusual and striking colors, including the heavy use of pure gold threads, attest to the artistry of the weaver; while the gold stripes at the bottom of the pattern denote that a woman of high rank and wealth in Japanese society wore this dramatic Obi. Hand woven of the finest pure Silk and Gold threads in excellent condition. approximately 13 inches wide by 12 1/2 feet long…typical size for a very old Obi. 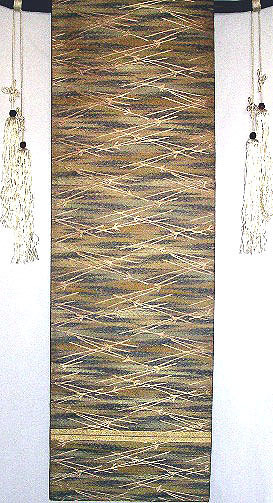 Creates an unusual and dramatic wall hanging, either vertically or horizontally, or extraordinary table or chest runner.